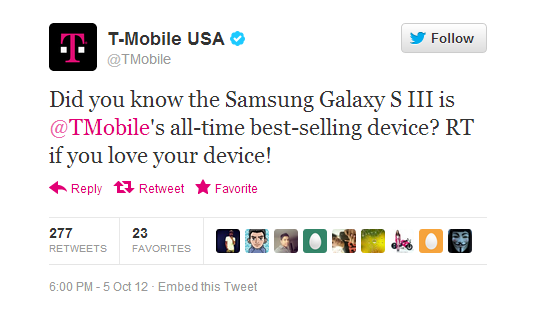 This afternoon, T-Mobile announced through their Twitter feed that Samsung’ Galaxy S3 device is their best-selling device of all time. There isn’t a link to the numbers to see just how many have been sold, but with a badge like that, it must be pretty impressive. T-Mobile has had some good devices in the past such as the Galaxy S2, the G2, the G1 (of course), and who could forget the OG Sidekick? Be thankful, Samsung that they still don’t have the iPhone 5 in their lineup.